Since the new millennium, the Trojans have trotted out a number of quality fantasy quarterbacks: Carson Palmer, Matt Leinart, Mark Sanchez, Matt Barkley and Cody Kessler. Heisman candidate Sam Darnold now wears the crown in Los Angeles. The sophomore sensation led USC to a nine-game winning streak to conclude the 2016 season. 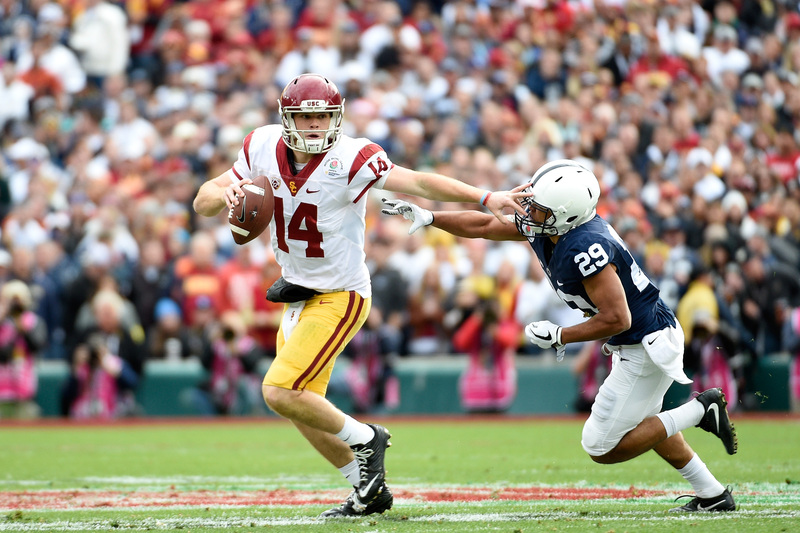 Against Penn State in the Rose Bowl, Darnold guided the Trojans to a 52-49 victory, overcoming a 14-point deficit to open the fourth quarter. He completed 33 of 53 passes for 453 yards and five touchdowns. For the season, Darnold tossed 31 touchdowns and passed for 3,086 yards. With stern leadership skills, he possesses a quiet confidence and exhibits sturdiness under pressure. While the pocket collapses and the play breaks down, Darnold avoids the sack, keeps his eyes downfield and fires a strike to a receiver. In the City of Angels, USC fans expect an enchanted season, and the latest Los Angeles luminary is primed to challenge Lamar Jackson for the Heisman. As a freshman last year, Jalen Hurts nearly completed another magical season in Tuscaloosa, steering the Crimson Tide to 14 consecutive victories and a conference championship before a last-minute loss in the CFP title game. Hurts was the first true freshman quarterback to start in coach Nick Saban’s illustrious career. He completed 62.8% of his passes for 2,780 yards and 23 touchdowns and rushed for 954 yards and 13 touchdowns, ranking him among the top dual-threat field generals in the FBS. He earned the SEC Offensive Player of the Year and Freshman of the Year by USA Today and ESPN. The sensational sophomore owns the athletic tools and leadership skills necessary to thrive once again. When on the move, Hurts is one of the most dangerous and elusive runners in the country. He can tuck the ball and gain huge chunk yards on the ground or fire a pass downfield for a big play at any moment. All astute fantasy commanders should target Hurts early in drafts this season. After missing the entire 2015 campaign, Logan Woodside returned and dominated the MAC last year. He led the country in touchdown passes with 45 and completed 69.1% of his throws for 4,129 yards. The Rockets concluded the season averaging 38 ppg. and 518 yards per game (10th in FBS) and won nine contests with Woodside behind center. Nationally, the pro-style passer ranked in the top 10 in many passing categories: yards, yards per game, completion percentage, yards per attempt and touchdown passes. For his outstanding efforts, Woodside earned All-MAC First Team honors. At 6’2” and 201 pounds, the senior does not have the prototypical size professional scouts covet, nevertheless, he does have classic pocket passer traits. Woodside sets up rapidly and is ready to throw immediately. He tosses a catchable ball on short and intermediate routes but lacks elite arm strength. Entering his final season on campus, Woodside must continue to improve in order to raise his draft stock across the NFL. Toledo must replenish a few key components on offense; however, the Rockets’ field general should come close to reproducing last season’s totals. How dynamic is Josh Allen? Just ask any college fantasy fanatic who knew about Wyoming’s jewel before many NFL scouts—and fans—did across the nation. Against Northern Illinois in the Cowboys’ season opener, Allen erupted onto the college landscape with an eye-opening performance: 245 yards passing and 70 yards rushing with three total touchdowns. In the middle of the season against Utah State and UNLV, the sophomore quarterback tossed four touchdowns in both contests. When the curtain closed on the campaign, he passed for 3,302 yards and added 512 on the ground, accounting for 35 total touchdowns. The junior could have declared for the Draft but chose to stay another season in Laramie, Wyoming. At 6’5” and 222 pounds, the playmaker ranks among the top quarterback prospects heading into the 2017 crusade. Many observers compare Allen to Eagles starter Carson Wentz, who also sprouted outside the traditional NFL pipeline. With rare arm talent, the ball explodes out of Allen’s hands, and he makes some incredible “wow’ throws on film. Unrecruited out of high school, the rising redshirt junior can cement a first-round grade with another productive season in the Cowboys’ pro-style offense. CFB mavericks are ecstatic that he stayed in school for another year. Even the most optimistic Nittany Lions fanatic would not have predicted the incredible season Trace McSorley orchestrated last year. The junior led the offense to the fifth-highest scoring unit (37.6 ppg.) in school history and threw for a school-record 3,641 yards with 29 touchdowns. On the ground, McSorley gained 365 yards and rushed for seven scores. He led the FBS in yards per completion (16.1) and finished 13th in passing efficiency (156.9). McSorley steered the Lions to the Big Ten title and named Most Valuable Player in the Championship game. In the Rose Bowl, he passed for 254 yards and four touchdowns in the loss to USC. The redshirt junior is closing in on many all-time school-passing records and should quickly move up the charts in offensive coordinator Joe Moorhead’s wide-open, deep passing attack. Can McSorley repeat last year’s production? There is no reason to expect a downturn in performance. When coach Dino Babers relocated to Syracuse in 2016, college fantasy fans immediately identified Eric Dungey as a breakout candidate, and the sophomore quarterback proceeded to become a weekly starter until he was injured the final three games of the campaign. Dungey established Orange records for passing yards per game (297.7) and average yards of total offense per game (330.2) last year. The junior field general has the arm strength and pinpoint precision to complete all the throws in Barbers’ hurry-up spread offense. Unfortunately, injuries have hindered Dungey during his time on campus: He has been sidelined for seven games the past two campaigns. While not as highly decorated as the other collegiate stars in college football, the dual-threat competitor produces just as many points when on the field. After amassing a 23-3 mark in 2014 and 2015, the Horned Frogs stumbled last year, winning only six games. While many fans blamed TCU’s new quarterback Kenny Hill, it is not a fair assessment of his production. The Texas A&M transfer suffered from an inexperienced receiver corps that dropped far too many passes. Starting eight games as an Aggie in 2014 before being benched, he passed for 2,649 yards and 23 touchdowns. Hill sat out the entire next season. In 2016, he blossomed in Fort Worth, Texas, accumulating 3,205 passing yards and 17 touchdowns while rushing for 609 yards and 10 touchdowns. An up-and-down performer during his college career, the senior should benefit from much better receivers with the return of KaVontae Turpin and Shawn Nixon. Hill has admirable arm strength and very good mobility; however, uneven play and lack of leadership hinder his draft status. He hungers to impress scouts and earn a roster spot in the NFL next year. In the offseason, Hill worked toward his goal, which bodes well for fantasy success. It took coach Chris Peterson a few years to implement his program and guide the Huskies to the top of the Pac-12 and national prominence once again. Washington won 12 games last year before losing in the CFP Semifinals to Alabama. A pioneering offensive mind, Peterson tutors one of the best quarterbacks in the country. Jake Browning set a school record, and tied the Pac-12 mark, with 43 touchdown passes. He also finished the year with numerous school records: single-game TD passes (6), yards per attempt (8.77), pass efficiency (167.52) and 50-plus-yard passes (8). The 6’2” and 205-pounder was named the Conference Offensive Player of the Year and finished sixth in the Heisman voting for his outstanding efforts. Surprisingly, Browning closed the campaign with an injured throwing shoulder—which Peterson never disclosed to the public during the season—after the Arizona State game in November. The injury clearly hindered his performance down the stretch. He had surgery in January and reports indicate that he’ll be ready for training camp in August. In 2-QB leagues, Browning is one of the top targets to acquire in drafts.